The first Mazzstock took place in 2008 and was a simple 50th birthday party in the backyard of Marlboro resident “Big Lee” Mazzola. Mazzstock 2018 will mark Mazzola’s 60th birthday and the party is still in his backyard. Did I forget to mention it’s a big backyard? Those in tune with the Rockland County music scene are in for a treat at this year’s Mazzstock, as Nyack-based musicians are among the headline acts, including Dylan Kelehan, bandleader of the fastest-growing Pink Floyd tribute act in the NY-area: Dark Side of the Hudson, and Ryan Liatsis, Kelehan’s bandmate in Dark Side and the leader of the mighty psychedelic funk jam band Shwizz. 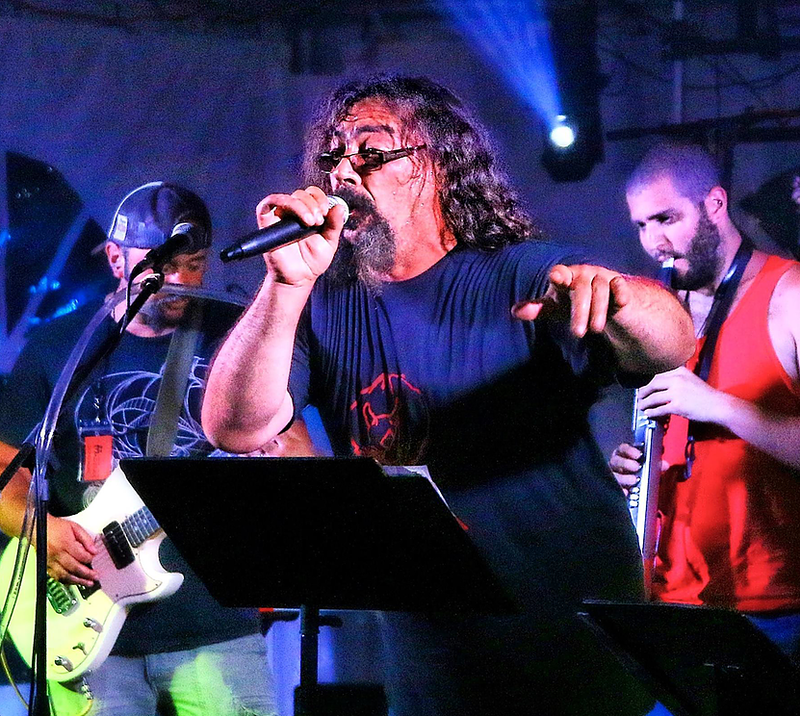 Other acts based in Rockland County include Tom Clancey, who plays in three Mazzstock bands; as the leader of Sky Daddy and guitarist in Grateful Dead tribute act Dead Meat and the Danielle Sheri Band. Nellybombs is another Rockland band playing. Over 500 campers are anticipated on the grounds, along with hundreds of day-pass attendees who show up for only part of the festival. The stock of Mazzstock has risen each year since its creation and there had been speculation last year that it had grown too big for his backyard and may move to a new, larger location. For at least one more year, Mazzstock will take place at Lee’s home on 35 Hampton Road in Marlboro, about seven minutes off of Route 9W. If you approach Mazzstock for the first time after dark, you are unlikely to easily locate it as the illusion that you are in a quiet residential neighborhood will fool your senses. No, Mazzstock is off the road a bit and the eye cannot quite catch it. Lee’s backyard is akin to a modest-sized fair-grounds set against a picturesque array of hills, fields, ponds and vineyards. When you find the party it will make sense. 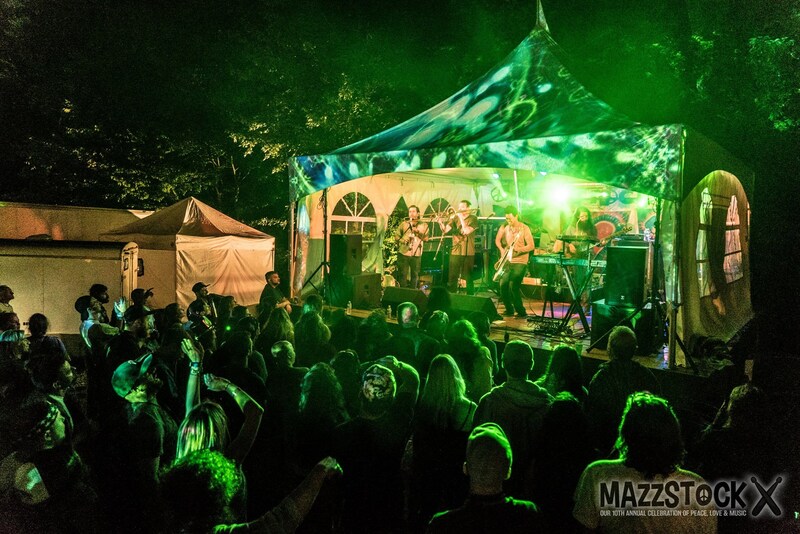 If you would enjoy hearing music from local and regional artists, as well as dancing and perhaps camping with friends, while surrounded by hundreds of other friendly humans from every corner of society, you can grab the last available tickets at www.mazzstock.com. Tom Clancey, a longtime Mazzstock fixture, helped recruit some of the Rockland bands new to Mazzstock. He said, “My band SkyDaddy has enjoyed growing up with Mazzstock, so to speak, and we’re so thankful to its hard working founder Big Lee and organizers Vinny ‘The Don’ Pomarico and Victoria Bourbeau—who are also some of our best friends on the planet—for giving us this stage. “Coming to Nyack, and immersing myself in the local music scene, I couldn’t help but urge The Don to bring some of the great local acts—like Dark Side of the Hudson, ShwizZ, Danielle Sheri and Dead Meat (which I also play in)—into the Mazzstock fray. Because the grounds have limited space, tickets are expected to sell out any day now. But Mazzstock has more than live music from bands. The revelers make their own music well into the night. Dylan Kelehan and Ryan Liatsis will perform at Mazzstock as two parts of the Nyack-based Pink Floyd tribute act Dark Side of the Hudson. 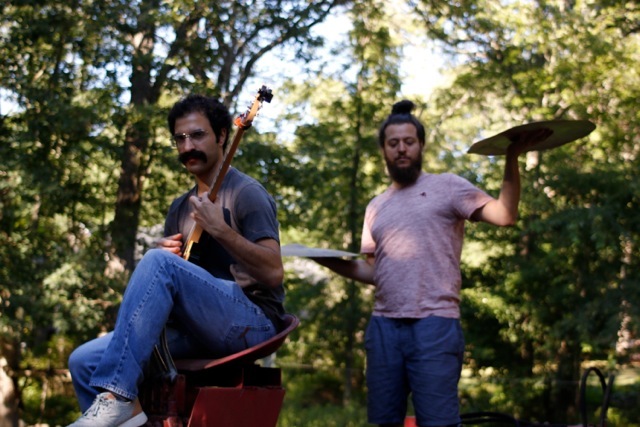 Last week, the Rockland County Times had the opportunity to speak with Nyack musicians Kelehan and Liatsis at Liatsis’s rustic music studio nestled in the woods of Call Hollow Rd. in Pomona. It appears that Kelehan is the Roger Waters [bandleader] of the Dark Side tribute band. Kelehan clarifies that unlike Waters, he is benevolent. Kelehan and his fellow tribute Floridans have carved an exciting path through venues across the metro area and beyond these past five years or so. Under his guidance Dark Side is supplanting The Machine as the go-to tribute act in the NY-area. Liatsis, hailed by many Rockland musicians as the most talented guitar-smith to emerge out of the county in recent years, will attempt to replicate some of David Gilmour’s entrancing riffs and solos, among other impressive feats during the set. While Liatsis clearly loves the Floyd, his own band Shwizz is his true passion. He and an evolving assortment of band members have created impressive music the past seven years. As I speak with Liatsis on his porch, he bears a strong resemblance to one of his primary influences; Frank Zappa. This is largely because he grooms his beard in a similar style to the late great king of sardonic rock. Like Zappa, Liatsis is a funny man who mixes humor into his music when he pleases. He made this aspect of his talent abundantly clear in the side-splitting 2017 Shwizz single “Listen to It,” in which Liatsis takes hypnotic suggestion to a level hitherto unknown to the people in this area. “We got this great new thing, came out the other day. You’re gonna hear about it. Over and over again, there’s just no other way. Ain’t got no fear about it. “We got this great new thing. You’re going to listen to it, just because we say that you should. We made the best new thing, came out just yesterday. You’re going to hear about it. “…And when it hits your ears, my wallet’s safe for years. We know we’re winning the fight. “We got the best new thing. You’re going to listen to it, because you know that we’re right! The chorus then disappears into a Liatsis guitar solo as good as any you’ll hear on FM radio. The song, which Liatsis describes as “by far the catchiest thing I have ever written,” only is half the package. It is the video, created with the help of Liatsis’s videographer cousin, that finally gave the Shwizz a taste of the fame they deserve. Go to www.shwizz.com and see for yourself. It is as funny as anything I’ve seen on a tube this year. Shwizz did attract plenty of attention for the song, with the viral Facebook video climbing to nearly 60,000 views. While my ears tell me that Shwizz’s popularity will continue to grow and that Shwizz and Liatsis could even “make it big,” the realities of the music industry these days are pretty harsh. In spite of enjoying their biggest splash only eight months ago with “Listen to It,” the Shwizz crew has been reduced from six players in 2015 to two players in 2018–Liatsis and drummer Andy Boxer. Longtime Shwizz bass player Frank Coda recently left the band. Liatsis said he does not expect to assemble a new version of Shwizz that includes a permanent bass and rhythm player. “It’s hard to find a player who will have the time to learn all the songs and to tour the region doing gigs,” he said. Though the band is down to two players, its sound has not gone quietly into the night. 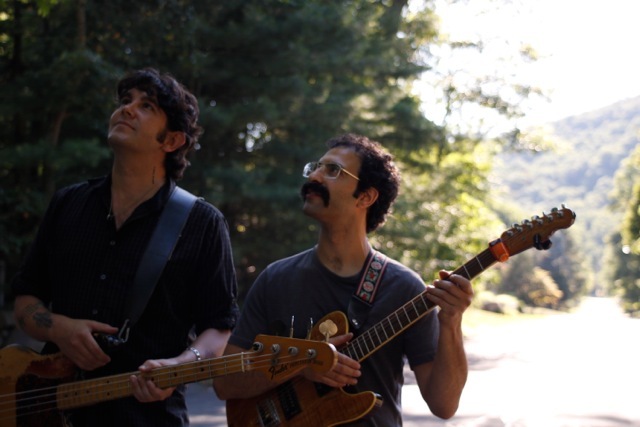 Liatsis told the Rockland County Times that the set he will play at Mazzstock with Boxer will sound different than what fans of the band have heard in their back catalogue. Lacking a bass player, Liatsis said it is time to let his guitar chops do more of the talking on stage. Liatsis is diving straight into the guitar-heavy sound. Fate has led Shwizz and Liatsis to this “brand new thing.” Show up to Mazzstock and hear all about it. You know that you will! Liatsis also noted that he will join in as a guest in sets with other musicians at Mazzstock. Perhaps keeping these guys a local secret may not be a bad thing for those of us in the know. That’s what makes a festival like Mazzstock special. There are dozens of Hudson Valley and northeast region artists who will take the stage, who have given their heart and soul to creating music. The mark they leave on each individual festival audience is an adventure unto itself. Kelehan said as long as he is playing music he loves for a living he will be fulfilled by his work. “If I make a living playing music, that means I am a professional musician. That is what I set out to do,” Kelehan said. Back in the 2000s, Kelehan was just another kid with a guitar wandering around Nyack. He set his sights on success and he has found a career that has seen him perform in almost 10 different bands, as well as the intangible reward artists covet: the feeling that comes when you bring enjoyment and inspiration to friends and strangers in a crowd. Kelehan also found love along the way, marrying and raising up a family. He uses his social media page to sing his wife’s praises frequently. The young family has a cameo in Shwizz’s “Listen to It” video. Liatsis tours with Shwizz frequently, and also works in the music industry as a producer, engineer and playing sessions with other musicians. He has his own music studio on Call Hollow Road, as mentioned earlier. One thing musicians do very little of these days is sell records. In case you hadn’t heard, most music today is consumed digitally on the Internet; often for free. Even mega rock stars can’t bank on gold records, let alone platinum or 10X platinum. Kung Fu, Zach Deputy, Roots Of Creation, Dark Side Of The Hud-Son (X2) Performing Pink Floyd’s “Dark Sideof The Moon” & “Wish You Were Here,” Hay- Ley Jane & The Primates, The Funk Junkies, The Mazzstock All-Star Band (Featuring Lee Mazzola), Alpha Male Gorillas, Cosmal, Skydad-Dy, Shwizz, Dead Meat, The Other Brothers, Junket, The Symphony, Jason Gisser, Cousinearth, Mutant Daises, Unexplainedbacon, Tigerman, Fred Zepplin, Wi- Ley Griffin, Escaper, Ldf (Ladies Drink Free), Nellybombs, Temple Roots, The Vm Project, Keys To The Moon, Young Country Vampires, The Family Friendly Criminals.